Los Angeles Kings defenseman Jake Muzzin is seen during the third period of a game in Los Angeles, Calif., on Dec. 8, 2018. Toronto Maple Leafs general manager Kyle Dubas continued his run as the National Hockey League’s boy wonder by pulling the defenceman his team needed out of his hat. 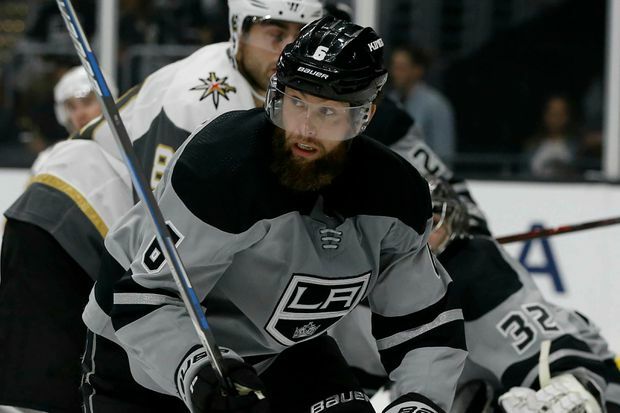 The 32-year-old GM landed Los Angeles Kings defenceman Jake Muzzin, 29, on Monday night from the Los Angeles Kings for the Leafs’ first-round pick in the 2019 NHL entry draft, forward Carl Grundstrom and the rights to unsigned defence prospect Sean Durzi. It was a brilliant move since it gives the Leafs the veteran top-pair defenceman they need at a price they can easily fit under the salary cap and without sacrificing a player from their NHL roster. On top of that, Dubas managed to land Muzzin, considered one of the top prizes in the league’s annual trading frenzy, one month before the Feb. 25 trade deadline. This gives him more time to adjust to both the Leafs system and his new partner, Morgan Rielly. With Muzzin joining Rielly on the top defence pair – there was no immediate confirmation from either Dubas or Leafs head coach Mike Babcock that this is the plan, but no one expects otherwise – Ron Hainsey will probably move down to the third pair with Travis Dermott. This will provide a veteran influence for Dermott, who is considered a talent on the rise, and bump Igor Ozhiganov to the press box. The second pair of Jake Gardiner and Nikita Zaitsev will remain intact. This gives the Leafs a set of six defencemen that can match up well with just about any team in the league. It is a huge leap forward and puts them back in the conversation as Stanley Cup contenders. While Muzzin is not the right-hand shot the Leafs were hoping to get in the trade market, he can play the right side, which is what they were after. The native of Woodstock, Ont., may not be a superstar like his now ex-partner Drew Doughty, but he is a proven winner and a top-three defenceman. He played a key role in the Kings’ 2014 Stanley Cup championship and was a member of the winning Canadian team at the 2016 World Cup of Hockey, which was coached by Babcock. The Leafs’ timing on this trade is good for another reason – Kings forward Dustin Brown recently told The Athletic that Muzzin, who has 21 points in 50 games this season, has been the team’s best defenceman this season. Muzzin has the rest of this season and 2019-20 left on his contract at an annual average value of US$4-million. While this helps Dubas with his task of dealing with the salary cap next season when big new contracts for Auston Matthews and Mitch Marner have to be added, it probably means Gardiner, who will be an unrestricted free agent on July 1, is even less likely to remain with the Leafs. However, the Leafs have a lot of defence prospects in the pipeline. Aside from Ozhiganov, the Leafs have highly regarded youngsters such as Timothy Liljegren, Rasmus Sandin and Calle Rosen moving up quickly. There may be some who argue the cost of a first-round pick plus Grundstrom and Durzi is too high for Muzzin. Grundstrom, 21, had 29 points in 42 games for the Leafs’ Toronto Marlies farm team, and Durzi, 20, is playing junior in the Ontario Hockey League. Both were second-round picks and both are considered by some to be among the Leafs’ best prospects. But there are no guarantees on either and the price for Muzzin was reasonable since the Leafs obviously believe the future is now when it comes to the Stanley Cup.